Farmington Valley vs. Guilford in the CIAC Division II state ice hockey championship, March 16, 2018, at Ingalls Rink in New Haven. NEW HAVEN — The Farmington Valley boys hockey team made its first appearance in a CIAC tournament championship game on Friday, facing defending champion Guilford. Despite the lack of championship game experience, the Generals made that first appearance count and took no prisoners. The Generals scored the game’s first seven goals, including two from Matt Arena, and Trevor Paluso had 19 saves to lead No. 1 Farmington Valley to a 7-3 win over No. 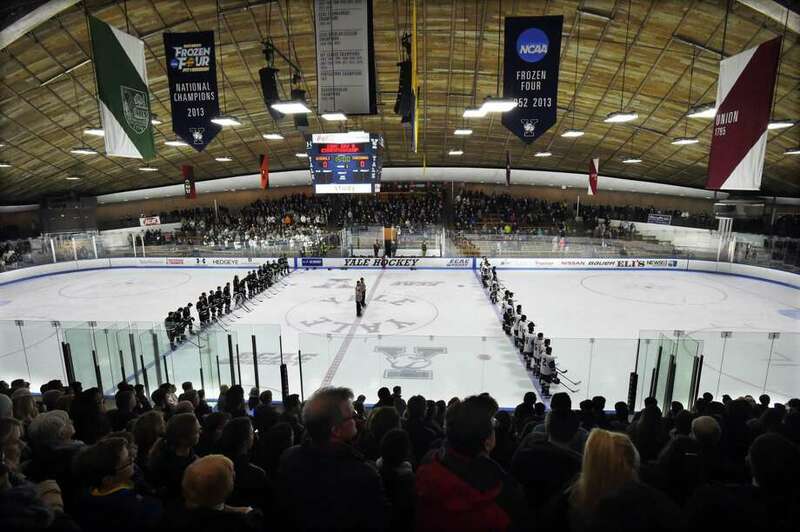 3 Guilford at Ingalls Rink in front of a packed crowd. The Generals finished the season 22-3-1. Guilford fell to 22-4. “I knew we could score more than five goals tonight,” Farmington Valley coach Mike Barone said. “Because of that, if we could keep them under six goals we would win this game. Our boys came through on both ends of the ice and our boys were flying tonight. In the first period Guilford had its chances, but Farmington Valley dominated possession and at one point outshot the Indians 9-1. The Generals ended up outshooting the Indians 14-7 in the period and came away with a 2-0 lead. The thought heading into the game was scoring phenom Tim Arena would be the player to break through early for the Generals. But it was brother and sophomore Matt Arena who gave the generals a 1-0 lead. On a breakaway down the left wing, Matt Arena took a slap shot at the bottom of the left circle that flew past goalie Mete Yanbul’s shoulder into the right corner of the net for the 1-0 lead at 11:16. The Generals continued to pressure Yanbul and Owen Lacourciere would add to the lead with 26 to go in the first period. He wristed a shot in front of the left post that got by Yanbul for a 2-0 lead at the first intermission. Guilford had four quality chances to score in the first period, but goalie Trevor Paluso kept the Indians off the scoreboard. Jack Dacey had one of the best chances for the Indians from about 15 feet in front of the net at 7:34, but Paluso came up with the stick save. John DeLucia had a close-range shot at the bottom of the left circle at 8:55 but Paluso came up with the glove save. The Generals continued to make their shots count in a dominating second period, scoring five goals to take a 7-1 lead into the third period. Farmington Valley’s Sam Buchanan took a slap shot from the left point and Jake Percival, camped out in front of the net, re-directed the shot into the net for a 3-0 lead at 4:46. Matt Arena scored his second goal to make it 4-0, Tim Arena made it 5-0 at 7:0, Kyle Kadziolka scored off a wrist shot to make it 6-0 at 10:46 and Eric Schweitzer made it 7-0 at 11:20. The Indians got one back late in the second period when John DeLucia scored off an assist from Joe Neleber at 13:42 to cut the lead to 7-1. Guilford got two goals back in the third period but the rally came too late. Jack Ring wristed a shot from about 10 feet out at 8:26 to cut the Generals’ lead to 7-2 and Jack Dacey made it 7-3 at 13:10. Yanbul had 24 saves for the Indians. First period: FV-MattArena (Peter Hoffman) 11:16; FV-Owen Lacourciere (Eric Schweitzer) 14:34; Second period: Jake Percival (Sam Buchanan) 4:46; FV-Matt Arena (Kyle Kadziolka, Jake Percival) 6:11; FV-Tim Arena (Marco Bernasconi) 7:01; FV-Kyle Kadziolka (Jack Murray) 10:46; FV-Eric Schweitzer (unassisted) 11:17; G-John DeLucia (Joe Neleber) 13:42; Third period: jack Ring (John DeLucia, Jack Dace) 8:26; G-Jack Dacey (Jack Ring, John DeLucia) 13:10. Shots on Goal: G 22; FV 31. Saves: G-Mete yanbul 24; FV Trevor Paluso 19. Records: Guilford 22-4; Farmington Valley 22-3-1. Ok since it’s ok to coop hockey towns it’s completely unfair and nonsense that the CIAC allows this corrupt system to exist. Many of these towns have enough kids for a team. The system will always be corrupt and unfair. Maybe next year Guilford can coop with North Branford and Branford for hockey. Oh is that to many kids….. Oh well everyone does it and gets away with it. Wake up CIAC SYSTEM HAS FAILED..